We’ve talked about creating your social media sites, not it’s time to link everything together. If this is your first visit, you’ll probably want to start at the beginning. 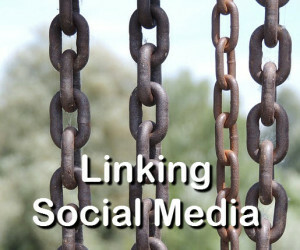 Linking your social media sites together. When we do this it serves a number of different goals. The first is that it allows people that are friends in one property, to be friends in another. Example: A Facebook friend, subscribes to your videos on Youtube, the follows you on twitter to make sure that they don’t miss anything. The second reason is the one that I like the best. All of the social media sites have a certain amount of link juice. When they are linked together that increases the amount of link juice they have. When we get more advanced, we can link from other sites to the social media hubs, again that just makes them better and your site better too. 3. Log in if you need to with your Google Account. 4. Click “Manage this Page. 5. Go to About Tab. In the links section click “edit”. 6. Add your links Click Save. -Go to your channel www.youtube.com. – Go to the bottom section and click Links / Pencil. – Add your links – these will appear at the top of your channel graphic. Add links into the box on the right.